timber house in the Field of Dreams, Findhorn FoundationThe Findhorn Foundation is a large community near Inverness. There is a strong emphasis on sustainable building. Are the British inherently nervous of timber buildings? Does this go back to the Great Fire of London? Is this still valid considering how many excellent timber buildings there are in mainland Europe? timber is inherently low in embodied energythe total amount of energy it takes to make a material (or a building). See more on embodied energy. This is especially true if the timber can be sourced locally. Probably the biggest challenge is to make a timber building airtight. Although this can be relatively easy with SIPsStructural Insulated Panels - prefabricated (usually in a factory) timber panels often forming part of an integrated building system and aimed at fast site erection. see more on SIPs it can be very difficult with traditional post and beamSubstantial, usually horizontal structural member.. With the increasing legislation around air tightness, particularly when reaching levels such as demanded by the Passivhaus standard, some experts have serious doubts about whether timber frame housing (of the post and beamtype) can reliably reach the standards required. 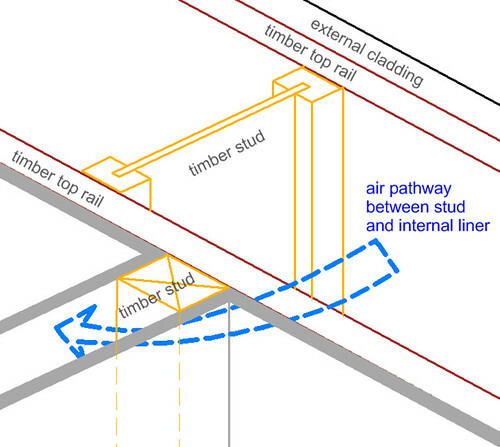 it is difficult to design timber frame with a continuous air tight barrier. With masonry construction, plaster can form a continuous air tight layer (although inter-floor areas need careful treatment) and this layer can go round corners and be made to join up without a break. With timber the problem arises of how to seal the joints where studs, joists and beams meet up. Particularly at a 3 way junction such as where an internal wall[for the purposes of part E of the Approved Documents] - Any wall that does not have a separating function. meets an external wall at floor or ceiling level there is a strong chance that air will infiltrate through gaps at the joints. The cold air may then simply enter the house or it may move through the wall and exit through a similar gap, causing a cooling fin. Although each such gap may only be a mm. or so (often caused by studs not being completely straight or smooth) they soon add up when there are lots of them. For instance half a dozen leaky vertical timber studs which had a 1 mm. gap at each side would be equivalent to a cat flap being left open all the time. Considering that a house might have hundreds of stud, beam and joist junctions, the possibility of not achieving good air tightness is considerable! One way to tackle this is to use compressive strips wherever a sheet liner meets the edge timber, top bottom and sides. Another is to use a flexible air tight membrane such as a vapour barrier around the whole of the internal surface of the building. In this case, taping the joints of the membrane will probably not be reliable in the long term and they will need overlapping and trapping by nailing wooden lats over the joints. It also takes a good deal of care to remember to insert the membrane before the internal studs go up. Timber tends to move over its lifetime and this may introduce leaks if joints do not have flexible seals. Good sound proofing between rooms can be a challenge. See part EThe Approved documentsApproved documents (England) are detailed publications which come under the English Building Regulations. They are based on tried and tested methods of building and if you follow them you are assured of complying with the Regs. The equivalents for Scotland are the Technical Handbook, for Wales: the Approved documents (Wales), and for N.I. the Technical Booklets, (England) part E, deals with resistance to the passage of sound of the Building regulationsThese are the mass of regulations that cover safety, health, welfare, convenience, energy efficiency etc. in the way buildings are constructed. Not to be confused with Planning consent (which is more to do with whether you can put up the building in the first place). See more on the regulations . The use of timber based internal lining boards and floating floors can be an advantage here. This 15mm push-fit plastic cold water plumbing pipe shows the teeth marks of a rat which chewed through it causing a leak in the wall. A way to avoid this is to sheathe the pipe in plasterer’s lath at the point where it comes through the wall. Timber buildings are inherently more likely to allow vermin to enter. Masonry buildings are designed to prevent this. With timber there is the possibility of long ‘rat runs’ which can mean that one small point of entry can allow vermin access to large parts of the building because of continuous cavities. This should be designed against using steel mesh such as plasterer’s lath. Because of the UK’s very limited historical use of timber housing (compared with say Scandinavia or North America), it can be difficult to get information on timber design. Most engineers can do large timber structures, some can do stuff like marine structures (piers etc) but few specialise in housing. North American web sites are heaving with information but the problem is that most of it is not directly relevant to the UK. Many traditional builders have virtually no experience of high quality timber design. 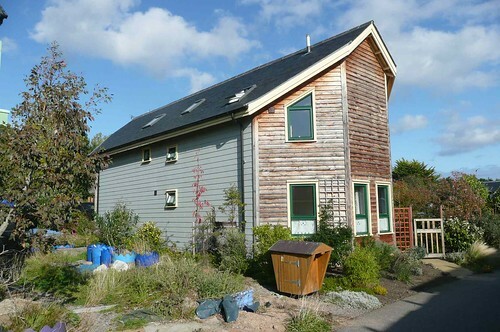 New on the market is Passivhaus Homes who do a kit house to Passivhaus Standard. Another option is the Walter Segalrefers to a simple self build timber frame form of construction pioneered by the architect Walter Segal. see details of the systemThe architect who devised a simple timber frame self build system (often simply known as 'Segal self build'). see more on the Segal method method for self build which offers a very simple method of modular construction based on standard material sizes. The actual constructional skills are very easy to acquire as there are no wet trades. There is some Sketchup3D modeling software 3D modelling software for designing small (up to 30m² floor area) garden sheds, tiny houses etc. using the Segal self build method. TRADATimber Research and Development Association A trade association with a strong reputation for research and publication on all things timber is a manufacturers’ and suppliers’ association which has, in the past been quite good on timber research and putting out technical information. They also run seminars on a variety of related subjects. They tend to serve the larger building companies but do have the odd course which may be of use to the self builder. However they seem to be becoming somewhat moribund in their thinking, especially now that standards of insulation and air tightness are being tightened up. They have been a bit slow in catching up with the technical side of domestic design as the improvements in Part L Building Regulations are tightened up and Passivhaus design standards seem to have largely eluded them.